I have written here about the importance, and even the helpfulness of convenience in friendships. I can’t and won’t try and deny it. It feels so good and effortless when you make friends with people in similar circumstances to yourself. Workplace friendships are a prime example of this. You both get paid to be in the same place at the same time…. And bonus, you really hit it off. It’s almost like you get paid to be friends!! Winning. You don't need to make time, you already found it. 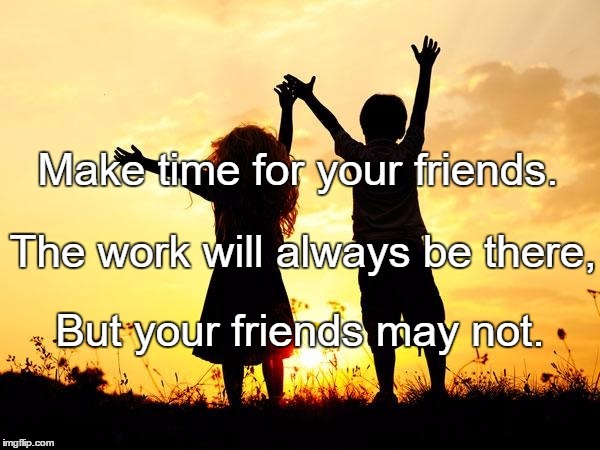 Unfortunately the down side is often reflected when you are no longer getting paid to be in the same place at the same time, and the friendship fails, fades, fractures or fizzles because neither of you made time for it. You were so used to “finding time” that was convenient, and it was too much hassle to make time. We are ALL guilty of this sometimes. We tell ourselves that we DON’T HAVE TIME, and we make ourselves, and our friends believe it too. As a stay at home mum, I can’t deny how wonderful it feels when I make friends who are available to lunch with me during the day, while the kids are at school and the partners (if they exist) are at work. It’s no hassle to see them when it is convenient for everyone. Then, almost inevitably, my lunch buddies return to work, and suddenly it is much harder to see them, because I have to MAKE time. Previously we were finding time, that was mutually convenient. Does that make sense? Finding time is easy. Making time not so much! Ironically, many of us do this, (choose TV) then complain that we feel lonely. As much as I appreciate those women who can do lunch with me on a school day, I appreciate the times even more when I know they have made a conscious choice to spend time with me over anything else. We are all busy people. If we can agree on a time that is convenient for us both, that is great, but if we can’t, we may have to choose each other. We may have to move an appointment, leave our partner at home with the kids, or take an afternoon off work to spend time with one another. As I mentioned recently, I remind myself to make time for friendships every Friday. Friendship Fridays because I am a big fan of alliteration! (A word I learned when my more intelligent friend pointed it out to me as I clumsily tried to express this word preference! haha) So each Friday, I think of someone who I should check in with, and make time to spend together. It might be the friend I saw a few days ago who is going through something, or a friend I haven’t seen in a few weeks, and should really see how she is doing. It does not mean I see a friend every Friday, it simply means I try to talk to my friends, and set up a plan to see them in person. I let them know I am thinking of them and that I care. It goes a long way. And it is relatively easy once it becomes habit. It is FINDING TIME to MAKE TIME! Time goes to whatever we prioritise. What we prioritise, we plan. What we plan, we action, and what we action we MAKE time for. We are never too busy for what we really want to do, we just choose ourselves more often than we choose each other. This needs to change. Choose friendships, not lonelieness. Reality TV is still not real at the end of the day. Get out there and live your life and share it with the people that matter. Newer PostExpressing your feelings VS Explaining them! Older PostDealing with Demanding Friends.